Are you looking for the best dog food for Pitbulls, something that will offer optimal nutrition so your fur-kid can thrive on a daily basis like he was meant to? Don’t fall for the everyday hype and end up settling for the mundane. Read the dog food guide below, and learn exactly how to seperate the best of the best from everything else! It was a sad day for English sporting enthusiasts when Bull Baiting was deemed cruel and outlawed in 1835. That didn’t stop those who made their living off of these animal combatants, the public soon turning to ‘ratting’. Pitbulls were first used for the sport of ‘ratting’, not dog fighting, as is the popular belief. The Olde English Bulldogge, having lost its main purpose, nearly went extinct- meaning the Bulldog descendants of today wouldn’t exist. Ratting enthusiasts sought a more agile breed, one more adapt at speed and agility, now that opponents weren’t massive animals weighing several hundred pounds more. Bulldogs of the day were bred with tarriers to produce a new kind of champion. Specifically bred for their bite inhibition and loyalty toward human handlers, the Pitbull Terrier was born. These dogs quickly grew in popularity, eventually venturing to America along with immigration around the turn of the century. Despite the popular yes misguided belief, the American Kennel Club ranks their American Staffordshire Terriers (their separate line of Pitbulls) at 99% with children and families. The United Kennel Club claims their recognized American Bully was bred to be the ‘ideal family dog’. During the first half of the 1900’s, Pitbulls quickly continued to gain fame as popular farm hands, working dogs, and even trusted children’s companions- earning the nickname ‘Nanny Dogs’. All dogs generally require the same basic nutrients for survival; the best dog food formulas won’t change too much between breeds. That being said, Pitbulls are considered a large, active breed, and their nutrition will reflect both their activity level and energy expenditures. Learning how to choose the best dog food for pitbulls is often about learning basic Canine nutrition in general, and how to discern high quality ingredients from fillers. Make sure at least the first ingredient, if not two out of the top three, are animal products- not plant products. Dog Food Rendering: Animal products are ground together and cooked at high temperatures in large, industrial vats, removing all moisture. The remaining ingredients are concentrated ‘meals’, produced for animal feed. Nearly every large scale pet food manufacturer uses this process. Watch this quick video (43 seconds) to get a better idea what this means. Meat & Bone Meal: ‘Meals’ are a product of the rendering process, often containing higher concentrations of protein. Specific items, like ‘chicken meal’ or ‘beef meal’ can be beneficial, as they contain much higher concentrations of animal protein for your pet. Random ‘meat meal’ (if you watched the short clip above) can be absolutely anything, as long as it is meat. Bone meal is ground up bone matter, considered difficult for our animals to digest, and only used because the manufacturer is too cheap to have it removed. By-Product: Clean, non rendered ‘parts’ derived from slaughterhouse animals, other than meat. This can include, but isn’t limited to, lungs, spleen, kidneys, brain, blood, bone, fatty tissue and stomachs and intestines freed of their contents. By-products are just another cheap way for manufacturers to maintain protein levels while keeping production costs low. Meat by-product Meal: These are meat byproducts that are rendered, solids added to pet food after rendering. Remember, this isn’t actually meat at all. Thought dogs were originally meant to consume animal meat, slaughtering these animals is much more costly for manufacturers than simply growing plant ingredients, like grains and corn. That being said, they will often use these ingredients as ‘filler’ products to make their foods seem like more than what they are. If you see any type of corn product, for example, among the top three ingredients of your dog’s food, you know it is a cheaply manufactured food. To better help readers understand the contrast between a high quality food and a low quality, cheaply made dog food, we’ve included an example below. Even though is it considered a poor quality food, this brand listed here is enormously popular, one of the most popular brands in the entire United States! Unfortunately, most pet owners aren’t educated in proper animal nutrition, so they refer to the many television and media advertisements painting wonderful pictures of happy, healthy pets chomping away at fantastic looking meals. Largely thanks to this false advertising, over 50% of domesticated pets are considered clinically overweight. This amounts to several million dogs across the US. Corn products consist of two out of the top three ingredients. Corn is a popular filler ingredient because it is very cheaply & easily grown. Though the second ingredient- Meat & Bone Meal- does provide a source of animal meat protein, owners have absolutely no idea where this meat came from (refer to the video above). On top of this, bone meal is considered difficult to digest. This product contains several other filler ingredients, very low in actual nutritional content. The food described above is Pedigree Dry Dog Food, both known and used by millions worldwide – one of the most popular brands in existence today. Your dog is still scientifically classified as a carnivore. His teeth are designed to tear at animal meat. He prefers the taste of animal products By-Far more than plants. His body was even designed to gain the proper amount of essential amino acids from an animal based diet, difficult to reach in a vegetarian one. Yet thousands of pet owners worldwide are trying to force their dogs and cats to become vegetarians because eating meat violates their personal beliefs. Any veterinarian will tell you your Pitbull can thrive off of a vegetarian diet, but it must be very carefully designed. Most suggest working alongside a veterinary nutritionist. Unfortunately, the vast majority of vegetarian pet owners simply assume their dogs will do fine from the same diets they eat, and their pets suffer for it. If you want to feed your Pitbull a vegetarian diet, make sure you talk with your veterinarian about the pros and cons. Cats are considered strict carnivores, and require meat for survival; they can’t live well off of the same vegetarian diet a dog may be able to. *Ingredients listed are an approximation from Dog Food Advisor, and not necessarily exact. Very few dog foods for pitbulls can even come close to matching the nutritional quality Orijen offers time and time again throughout all their brands. Where most great dog food for pitbulls might offer one or two, maybe even three sources of animal protein before hitting the fillers, you won’t see a single unnecessary ‘filler’ or controversial ingredient among the 15 listed below! You’ve got the best of animal protein, several types of fish, and even whole eggs to top them off. If you’re the type of pet owner who wants to give your dog the absolute best there is, and you’re willing to go the extra mile to do so, Orijen is your food of choice! Not only are the first two ingredients high quality sources of animal protein, they’re deboned for easy digestion. This recipe contains four different kinds of fish, offering more than enough essential fish oils. Instead of egg product, Orijen Original offers whole eggs for complete nutrition. Although they may not seem appetizing to humans, the organ meats contained are extremely nutritious. You’ll notice very few brands go the extra mile here. This is a top quality premium dog food for pitbulls; there aren’t and cons here. 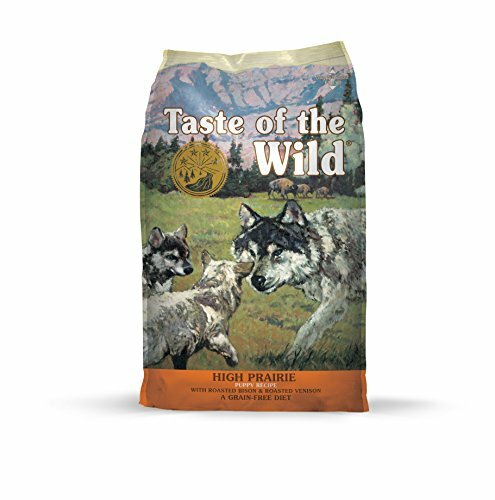 As a well & longtime respect brand in dog food, Taste of the Wild continues to produce fantastic yet affordable products for dog owners worldwide! They offer plenty of animal protein here, as well as egg and fish ingredients for additional oils essential for a healthy pet’s diet. As the first ingredient, Beef provides plenty of quality animal protein. Lamb meal is considered a protein concentrate, offering up to 300% more protein than regular lamb meat. Ingredients such as peas, beans, pea flour, brewers yeast, tomato pomace (etc.) are considered fillers, not always necessary. Canola oil is a controversial ingredient because it can sometimes (but not always) be derived from genetically modified rapeseed. 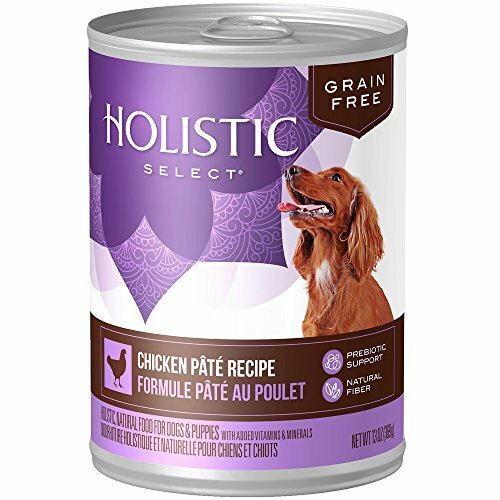 If you’re looking for a great canned dog food for pitbulls, Holistic Select is our top pick! For one, you’ve got beef and pork liver among the top three ingredients, offering more than enough essential amino acids for your Pitbull to thrive. Holistic Select continues to offer whitefish, another great source of nutrients and fish oils to boot! The very first ingredient is a high quality source of animal protein. The third ingredient is pork liver, an organ meat and valuable source of nutrition. Whitefish is offered as the fourth ingredient, providing plenty of essential fish oils. Potato protein is unnecessary, the dry residue left over after removing the starchy portion of a potato. 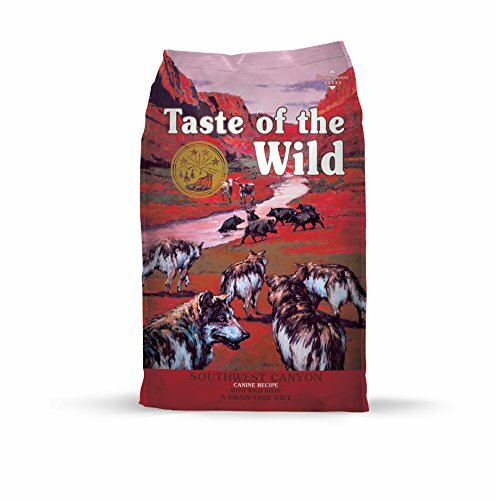 If you’re looking for a great, affordable puppy food, you can’t go wrong with Taste of the Wild! Not only is this great puppy food grain free, it offers multiple forms of animal meat on top of egg product to support a sleek coat and healthy skin. Fruits and vegetables offer antioxidants to help combat cellular damage from free radicals, while your Pitbull puppy will get plenty of the essential amino acids he needs for optimal health! Buffalo and lamb meal are the first two ingredients, offering fantastic sources of animal protein. Lamb meal is considered a protein concentrate, containing up to 300% more protein than regular lamb. No excess grain or corn product ‘fillers’ are used to make this food seem more than what it is. Antioxidants help fight free radicals that cause damage at a cellular level. The ‘pea protein’ in this formula isn’t necessary, as it doesn’t contain the proper amino acids. Tomato pomace and potatoes can be considered filler products. 1. What should I feed my Pitbulls? A dog food for pitbulls rich in animal based ingredients, focusing on animal (not plant) protein is the best choice. You want to ensure your Pitbull is getting the right type of essential amino acids from his diet, and it’s hard to get those from a vegetarian diet or one focusing on plant products over animal. From there, you really have hundreds of manufactured dog foods on the market to choose from. 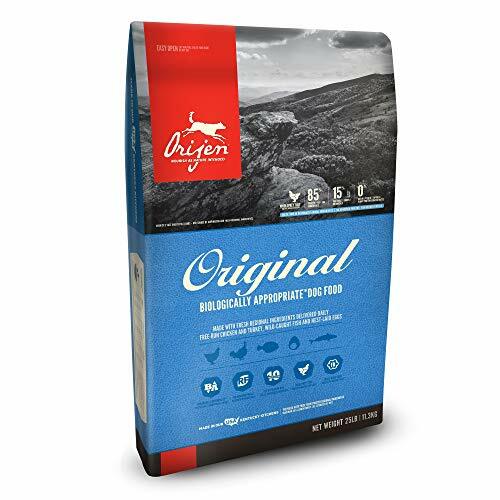 Orijen premium dog foods are probably going to be one of your best options, but Taste of the Wild, Blue Buffalo, and Earthborn Holistic are three more brands that produce quality foods. 2. What kind of dog food is best for Pitbulls? Believe it or not, most dog breeds have similar nutritional requirements. They all need the same essential amino acids, vitamins and minerals. They all need a certain amount of water (though it varies on size and activity). That being said, a Pitbull’s dietary requirements won’t differ too much from, say, a Labrador or Husky. Personally, I’ve never seen any manufactured brand produce anything better than the foods produced by Orijen. You should feed your Pitbull designated dog food, not human food (as human diets are higher in sodium). Though it is a huge subject of debate, I would personally avoid raw animal meat; make sure your meats are cooked. I’ll explain that further below! 3. What is the best dog food for puppies to gain weight? This really depends upon the age of the puppy. Puppies younger than 4 weeks should be feeding from their mother’s milk. At that point, they should transition to wet puppy food. Between 6-8 weeks, you can slowly make the transition to dry Puppy food. Make sure you’re feeding your puppy designated puppy food. At that point, the quality of your puppy’s diet depends on the quality of puppy food you choose to feed your dog. 4. Should I feed my Pitbull raw meat? Raw meat diets are both an enormous topic of debate, and becoming more and more popular! At one time, wolves lived off a diet of raw animals, whereas today everything we offer our dogs has been cooked. Unfortunately, there is a loss in nutrients during the cooking process, which is why many people recommend raw diets. However, our domesticated dogs aren’t wild wolves, and don’t inherit the same resistances from their mothers. There is a risk the raw meat you are feeding could contain dangerous viruses/bacteria or parasites normally killed during the cooking process. In my opinion, the health risk simply isn’t worth the minimal gains your dog might get. If you feed your Pitbulls meat, cook it first. 5. What is a ‘limited ingredient’ dog food for pitbulls? Veterinarians will often recommend limited ingredient dog foods to combat skin allergies, or other types of food related allergies. Because it is difficult to pinpoint the exact ingredient dogs with food allergies are allergic to, limited ingredient diets help eliminate possible causes. If your Pitbull has a food allergy, your veterinarian will almost certainly prescribe a limited ingredient diet. 6. What is the top affordable dog food brand? When it comes to dog food for pitbulls, like most other things, you get what you pay for. If you’re the type of pet owner who wants to settle with the cheapest thing you can find, your pet’s nutrition is probably going to suffer. If you are willing to go the extra mile and spend a little bit more, your dog’s health will certainly thank you. That being said, there really is no ‘top affordable dog food’. The entire concept also depends on the pet owner. All of the foods above are quality dog foods for pitbulls ranked based on their considerable nutrition, not affordability (except for the poor quality example). 7. My Pitbull is overweight. What can I do? Consult your veterinarian about your possible choices, and where to proceed with your overweight pet. They will usually be your best resource! So many domestica pets are considered clinically overweight for two main reasons: a cheap, low quality diet offering poor nutrition, and lack of physical activity/ exercise. If you are already offering your Pitbull a high quality diet, start thinking about his or her activity levels. Do you take your pet for daily walks, or does he lie around doing nothing every day? Do you play physical games with him (agility training, for example), challenging your pet both physically as well as mentally? Does he have a fenced in area he is able to run around in, or is he confined to the house all of the time? Knowing how to provide the best possible nutrition for your pet is going to take devotion on your part. It’s going to require a little bit of research. Yes, you’ll have to spend some time reading- but isn’t your pet worth this small amount of effort? Don’t let your Pitbull fall in that 50% plus category of clinically overweight dogs. Don’t listen to your friends, or media advertisements. Educate yourself, and stand out among millions! What do you think? Feel free to share your opinions in the comment section below!